You guuuuys, it’s been so long since I’ve even mentioned my favourite blogging tool – The Olympus PEN EPL-7; after I had to send it away in the summer for more than a month, I kinda lost my passion. Well, just a little bit! I don’t think it helps that we’re now in the depths of Winter and the light is bad which makes taking a good photo that much harder. I’m also not a huge fan of the “standing there” after a workout shot so since my Narrative Clip bit the dust (that’s a story in itself!) I’ve not had too many action shots from sweating to share in IG. I got to have a little play around with this at an Olympus Bloggers workshop in the summer (I think!). I added it straight to my wishlist on amazon. This particular model is the 9mm f8 – it can capture a whole room in one image without having to lodge yourself in the corner of the room on the highest possible surface! The quality is decent enough however in low light conditions it may not work so well. The lens also doubles up as a lens cap with it’s own closing mechanism which is an added bonus. If you’re gonna jump on the video bandwagon for 2017 (it’s set to get even bigger) then this is worth getting. 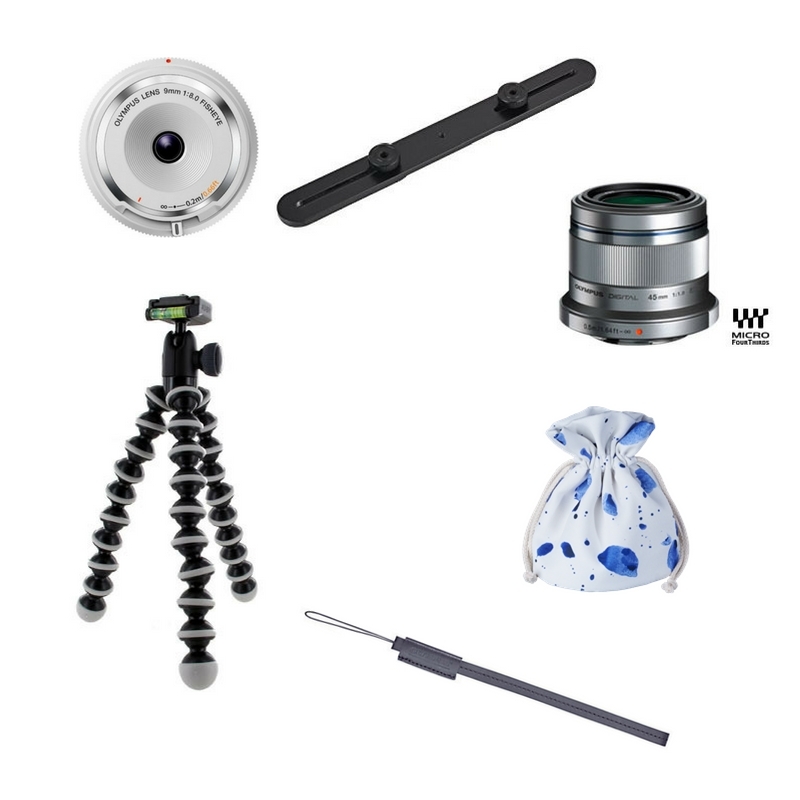 At around six or seven pounds from Amazon, it allows you to use a tripod and be able to view your screen flipped down / yourself talking for recording your vlogs. Now, I made this purchase just a couple months after buying the camera itself and for a long time I loved it. The reason I loved it was because it was just so easy to take a good photo. As time went on and I learnt a little more about photography I came to be able to also take good photos with the 17-42mm kit lens so the usage split is now a lot more even. You can pick it up in black from John Lewis or silver from Amazon. …now if you’re lucky enough to have a £300 – 400 camera and maybe a £200 lens you might want to look after them right?! Mine are usually at the bottom of my handbag and have been subject to abuse from water bottles (and the actual water in them), food and pens. I absolutely loved the handbags come camera bags but generally I need a bag that holds a lot more than the camera itself. So I opted for a pouch for my camera body itself as it’s padded and protects it from dirt, along with one for any lenses I will carry at the same time. They look super stylish and aren’t priced too badly – check them out from the Olympus Store. For at least the first year of having the PEN, I used the shoulder strap that came with it. I found it got in the way a lot so not too long ago I purchased the leather wrist strap which works a lot better for me. There are a range of colours you can get it in; you can get pink like I did from Amazon! This is the most recent accessory purchase I have made and one of my favourites! I have a regular tripod (check out this post on my blogging toolkit) but it’s just a little too big and conspicuous to carry around on a daily basis. The Joby Hybrid Tripod is perfect for the size and weight of the PEN (I know from experience as I had the original version and it would just fall over when I tried to use my PEN with it!) and is so quick and simple to set up and use. I recently used it to take some shots while I attended my session at The Running School (check out my IG post) – I used the custom settings to put it on a 10 second delay, to take 4 shots at 3 second intervals. So hands up who got the Olympus PEN for xmas?! …any other must have accessories you would recommend for the PEN or photography in general?! As I write, I'm waiting to take delivery of my EPL – 8!! I was just scanning the net for help wit using the camera – lens down for video on a tripod and came across your fab review. Thanks so much for sharing all this useful info. Definitely going to get the wrist strap you mention too. Thanks again, great review! Thanks so much for stopping by and commenting Samantha! Hope you are enjoying your EPL-8!